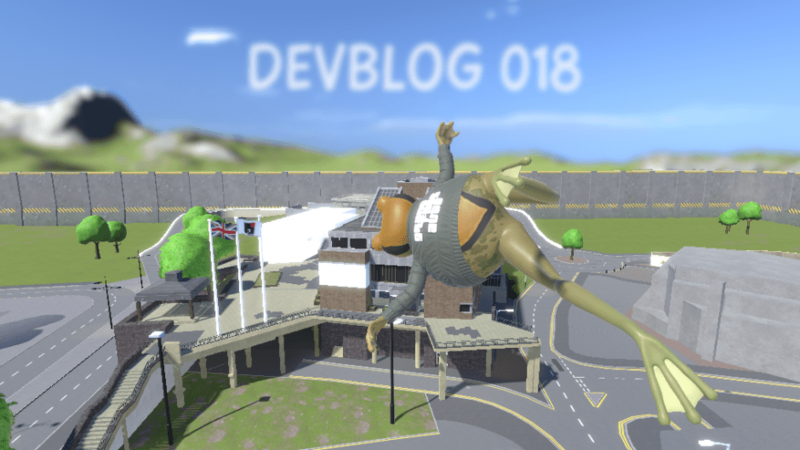 Looking back we have noticed how writing devblogs has started to be really helpful to us. We spend so much time spent focused intently on small corners of the game, that stopping to write a devblog forces us to step back and gaze at the bigger picture. With a wider view of everything its a good opportunity to check in on the overall presentability of the game, but also to help us to refocus on the main task of creating this world. One task always leads to another, for the past few weeks i had definitely lost sight of where i was heading. Fortunately, i tend to trust my instincts and while sending myself off on a series of tasks I can always find my way back to where I was heading by completing them. Each smaller task being a breadcrumb in a trail that brings me back around to a larger more important task which i had forgotten about. When i get back on track its almost like… oh yeah I remember why I started doing that seeming unrelated thing now and I understand why my previous self sent me off in that direction. So one of my biggest distractions recently is a new User Interface system(UI) I have been building. Basically, we want more customisation throughout, from clothes, to cars, to weapons, to modes, to servers, to quality settings and so on and so on. We need a unified UI to make this happen. Its important that we have something that can scale with the game as it grows, by working as a prototyping UI and also a finished UI. I needed to make a system that we can use productively in development to perform all these different types of operations, but will also work for players in game. Also, we need a UI that will work for all input devices and in a much more coherent way that the UI was in previous versions. Think fPhone 2.0, or something like that. Feeling really positive about it and what its going to mean for the possibilities for the future of Amazing Frog?’s continuing evolution. Although as I said to Hal yesterday, “I just spend all day programming away like Jessica Fletcher from Murder She Wrote and all I have to show for it is a button that disappeared when I pressed it”. Sounds bad… but actually it was a good day as it proved to me that the new system works… Next I can use it to displaying interactive connection data or rapidly build a clothing moderator or settings manager … well I will decide tomorrow. 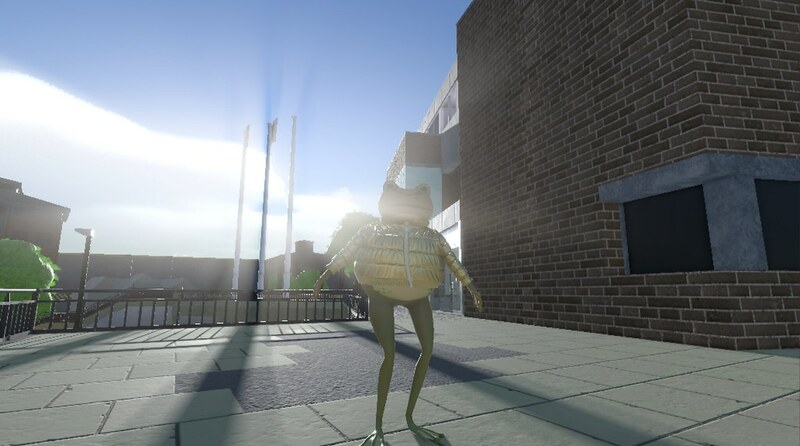 As you can see from screen shots we have posted over the past few months, The level of detail in the new Amazing Frog? is much higher than before. Its not just about the models and textures, but also the surfaces and lighting. Hal has been improving how we see the buildings from distance, by manufacturing more accurate lower Level Of Detail(LOD) instances of everything. This is all very much about optimisation. Rather than having all the buildings in view in high detail with loads of polygons and materials being rendered, we make simpler versions that you see when you are further away and then how the low detailed object is displayed is based on view location and quality settings. We have also been doing this kind of optimisation on the shadow casters and reflection probes. We have so many active lights in Swindon now, all capable of shadow casting, that it was imperative to cull that activity. 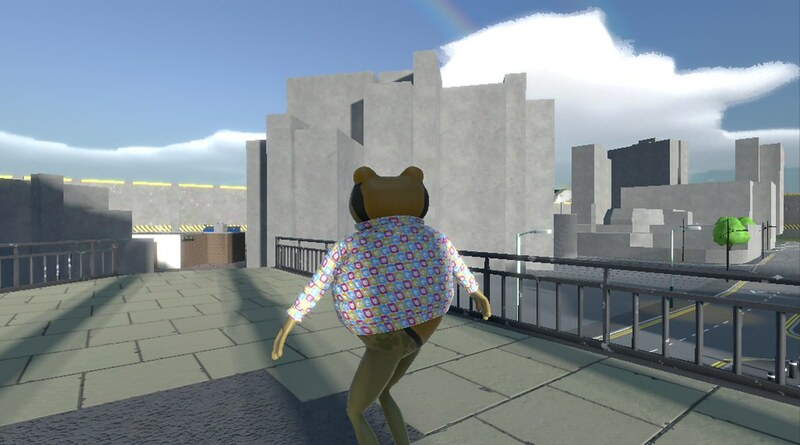 As I mentioned in a previous post, we were doing away with all the old style models and assets some of which dated as far back as the OUYA and some were even originally made to run as background assets on an iPhone 4. That included most of the architecture, but their physical presence in the space is quite important. Instead of removing them completely we have “concreted” them. This is to allow them to still function … you know as big blocks of mass and to help you navigate er… vertically. We felt this would be a better way to represent the missing architecture of the old style temporarily, while Hal is working his way through them. Although currently he has been focused on covering the frogs lower regions. Really excited about where the clothing is going. Hal has been making it much more physical and the library of items of clothing to be worn in combination is growing steadily. 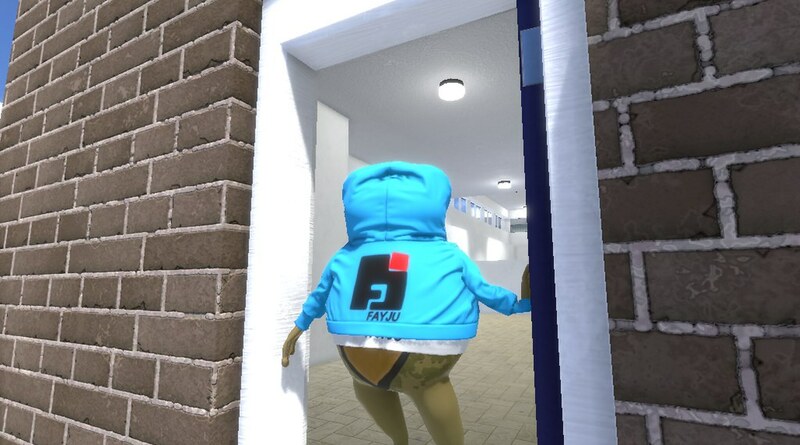 No trousers (aka pants) in the screenshots, but we’ve got them too (will show you next time) There is a puffa jacket and some hoodies now. 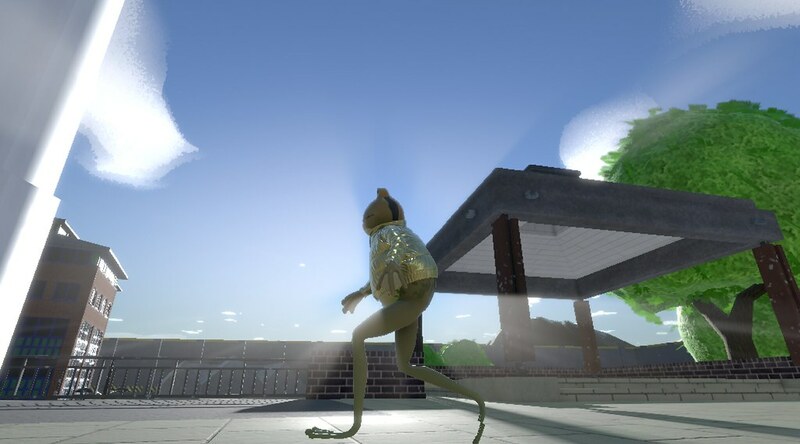 A larger selection of clothing is what we always wanted for Amazing Frog? especially as we become an online game. We wanted enough variation to create your own unique frogs. This extends to how we have been recreating other features too, as you have seen with the cars. 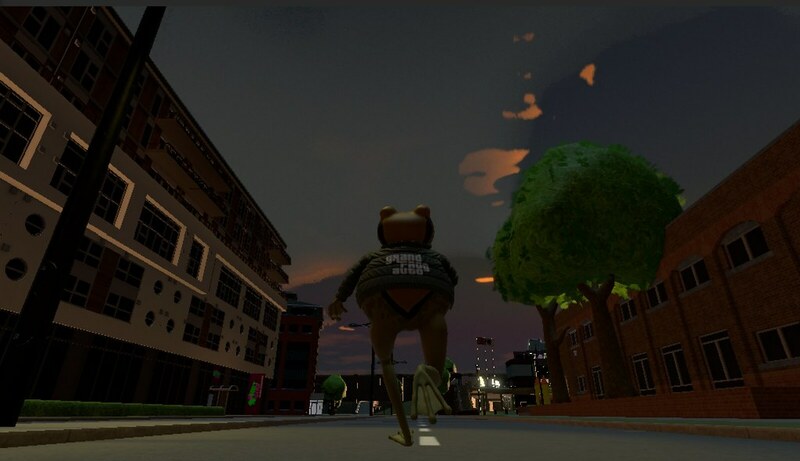 We know there is a big wave of customisation coming to Amazing Frog? This is why I mentioned earlier about the necessity for the new UI system and why it has been important to create a solid foundation for it. I just like this image with the sun rays… I’m really excited to show you what we can do with the day, night and weather systems… but I think static screen shots don’t really capture it that well. Don’t worry about all these image effects too, the intention is to make many of them optional in quality settings. So I guess we should get back to it. 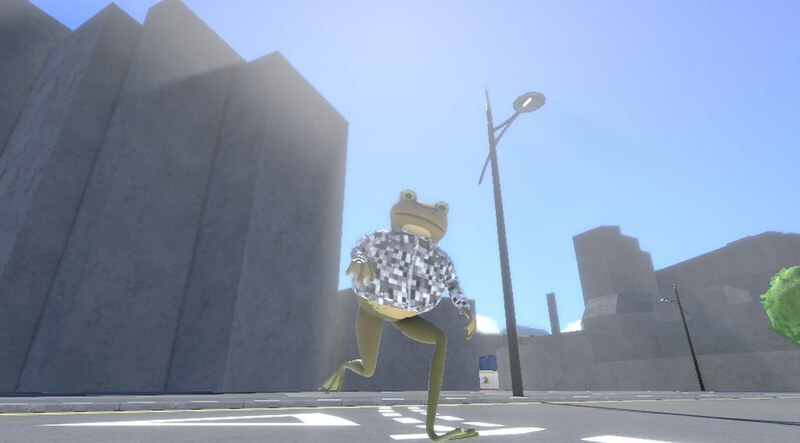 Sorry for the wait on Devblog 018 , Thanks for all the positive comments it means a lot to us, while development can sometimes feel a little overwhelming, we kind of live for this and don’t want to be doing anything other than making Amazing Frog? 100 more years Amazing Frog Development … .dot com.